This was written by admin. Posted on Friday, October 30, 2015, at 5:10 am. Filed under Uncategorized. Bookmark the permalink. Follow comments here with the RSS feed. Post a comment or leave a trackback. Well, I’ll give both writers credit in that they understand the real opposition candidate to Jennifer is Dave and not Tom. I don’t get the obsession with an extravagant 5th Avenue Pavilion. We would benefit by having a pool and an open air pavilion with sliding barn style doors that can be secured or removed as the weather permits. sold problem. beach badges would be available at that location as well as other booth locations on the boardwalk. Problems solved. Wonderful boon for Belmar. Think Avon and Spring Lake pools. Think original 5th Avenue pool. Vote No to 4.1 million dollar pavilion question. Love the pool-pavilion idea. All different ages taking swmiming lessons, zunba classes,lap swims, perfect together. Everyone would go for a Pool-Pavilion. Let’s go with “A Belmar Plan For A Pool-Pavilion”. Mr Murray is another shill for the Democratic Party he owns no real estate in Belmar. You’re right on the money on this one. Yet another individual who does not reside in Belmar having influence over this administration. Disgraceful. Plan a Pool-Pavilion works for all generations, locals and visitors a like. Exactly what is really needed in Belmar. No catering hall on the boardwalk is worth 4.1 million that’s for sure. All the commercial businesses across the street and throughout town wouldn’t have to compete with the big concessioners either. They could actually earn a living and pay many more employees as a result. Brillant. Smaller is better, small breakfast and lunch bies for us folks is all we really need. Open window for service from the beach for quick service would be back the way the beach was always enjoyed. Excuse me Mr. Brody if that is your name who cares!! Dave never called anyone a Terrorist. I never saw you criticizing the Mayor for him calling residents Terrorists you are a biased fool. I agree with Gene Murray – let’s get it on on the BEACCH!! BAYBAT!!! Boring Belmar is boring. D’Jais Belmar is da bomb!! Jager shots vote maybe get crazy. I need an aspirin, heading to Family Dollar. 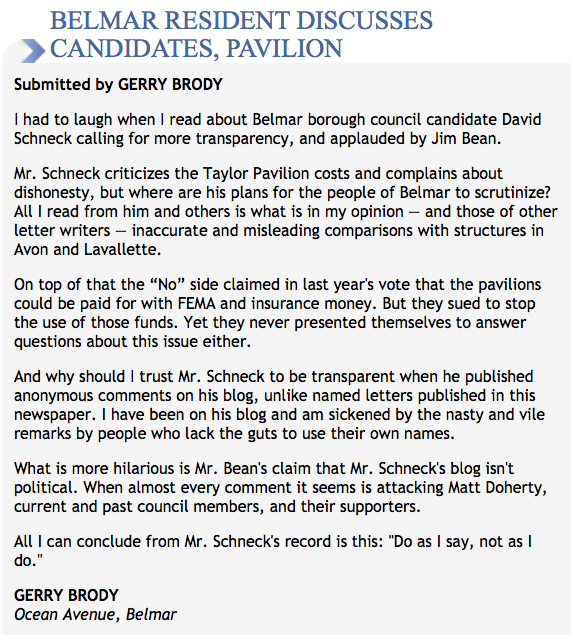 Mr. Murray should talk to the Belmar tax assessor …. commercial property tax assessments dropped 5.5% for 2015 …. and residential went up 2.7%. And under redevelopment some pay no property tax. What the 2 Democratic biased letters fail to say is that lets assume we approve the bond or bonds, this means you have to raise the real estate taxes. The businesses that own or rent the space to conduct business have to raise their prices to offset the tax increase. Gene who is going to spend $8 or $9 dollars on a wind mill hot dog??? The seasonal businesses will be the most hurt as people will not pay outrageous prices for a T shirt or ice cream etc. The small businesses like the dry cleaner will move out. I guess the Democratic want more vacant stores in Belmar. I forgot to add, the Democrats and Unions want to increase the minimum wage to $15 an hour. You increase that and the taxes, the old Acme site wont be the only vacant eyesore in Belmar. My favorite thing is Ms. Brody doesn’t think I have the right to criticize the pavilion plan unless I’m willing to sell all my cars and furniture and take out a second mortgage on my house in order to pay hundreds of thousands of dollars for complete architectural plans and engineering reports for a design that the mayor will shoot down without even looking at. 17 Admin I think she and her cohorts want you to move out so more million dollar homes are built to compete with Spring Lake. Typical Democratic theme squeeze out the middle class. I think the administration wants to level your house and use the property to make a parking lot. With me still inside it. Maybe we will find Jimmy Hoffa. I was wondering about that strange smell coming from the basement. #22 No the smell is from the Democratic Party casting spells on you at night because you are creating havoc with their evil ways. Anyone who wants to build expensive pavilions on the ocean must be some kind of climate change denier. Didn’t they watch al gore’s Fahrenheit 911 Slideshow? What thing I found interesting in Ms. Brody’s letter was her comment disputing Jim Bean’s assertion that Common Sense isn’t a political blog. The Administrator presents straightforward information gleaned from diverse sources, all of interest to Belmar’s residents. When he believes it’s appropriate he includes editorial interpretations. Additionally, when he thinks he’s misspoken, he acknowledges that as well. Individuals who post comments, myself included, have named politicians, as well as political party’s as being culpable for specific situations, events, evasions, unethical practices, etc. 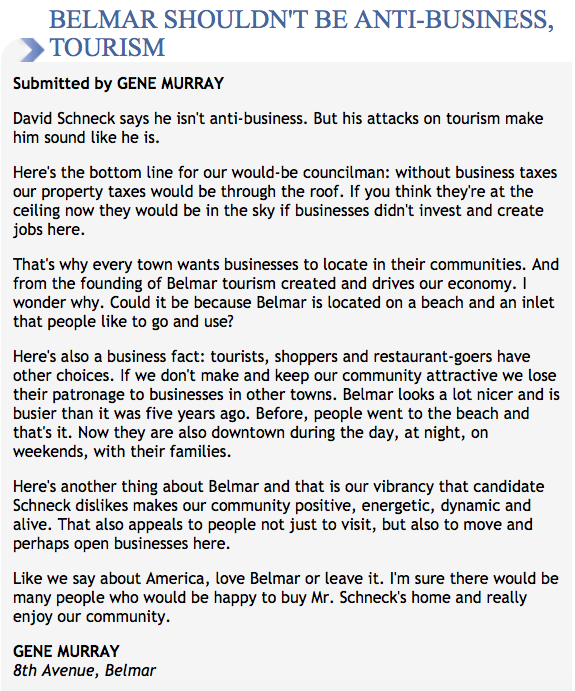 These comments represent individual residents of Belmar exercising their right to free speech. Some people choose to create a non de plume. That is also their right, and in an environment of intimidation and retribution completely understandable. I don’t believe in the value of partisan politics, and I absolutely do not view Common Sense as a political blog. Global warming is a hoax don’t you know that by now, it’s about money not climate! At one point Belmar had on the north west corner of Ocean ave a wonderful pool. Most of the people using it were locals. It was big clean it had bath houses and lots of fun for kids and parents. It could happen if you could get the people to agree on salt or fresh water. maybe.